ELA.RF.4.4b: Read on-level prose and poetry orally with accuracy, appropriate rate, and expression on successive readings. ELA.W.4.3b: Use dialogue and description to develop experiences and events or show the responses of characters to situations. 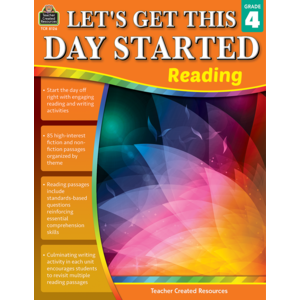 ELA.W.4.3a: Orient the reader by establishing a situation and introducing a narrator and/or characters; organize an event sequence that unfolds naturally. ELA.W.4.9a: Apply grade 4 Reading standards to literature (e.g., “Describe in depth a character, setting, or event in a story or drama, drawing on specific details in the text [e.g., a character’s thoughts, words, or actions].”). ELA.W.4.9b: Apply grade 4 Reading standards to informational texts (e.g., “Explain how an author uses reasons and evidence to support particular points in a text”). ELA.L.4.1d: Order adjectives within sentences according to conventional patterns (e.g., a small red bag rather than a red small bag). ELA.L.4.3a: Choose words and phrases to convey ideas precisely. ELA.L.4.5b: Recognize and explain the meaning of common idioms, adages, and proverbs.